Developed, used and recommended by dental care professionals and backed by extensive scientific research, the UltraDEX range delivers exceptional oral care, whitening maintenance and fresh breath confidence. The products incorporate clinically proven technology that works with the natural oral pH level to release the appropriate amount of active ingredient to meet the individual needs of each mouth. Available in a range of products offering a comprehensive and effective oral care regime. 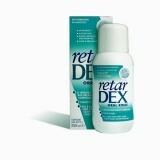 The brand recently changed its name, from RetarDEX to UltraDEX.